Architectural Digest recently published an article choosing Cinder House as Missouri's most beautifully designed bar. The article outlines the most beautifully designed bar in each U.S. state. 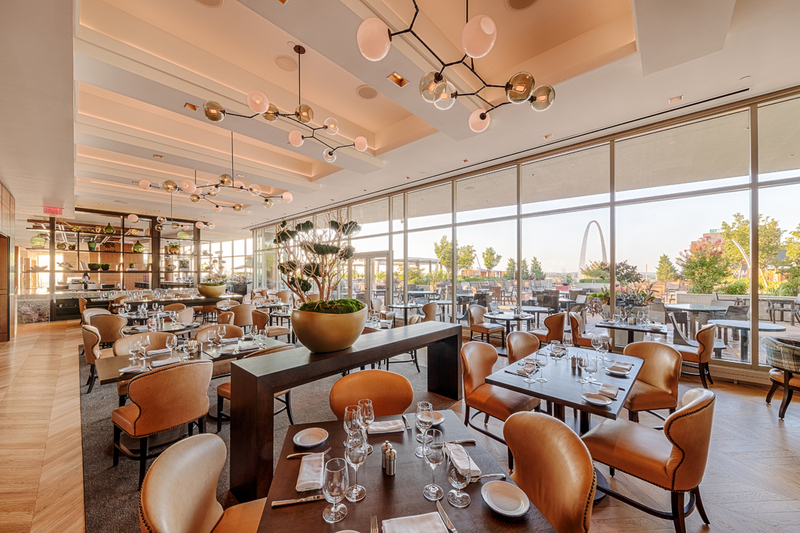 Cinder House is the recently renovated restaurant atop the Four Seasons Hotel in downtown St. Louis. Views of the Gateway Arch from the eight-floor floor-to-ceiling windows coupled with high-end South American inspired finishes create a unique atmosphere. Additional features include a new bar on the patio, a custom designed hostess desk and sofas, and lounge areas throught the space. Other interior finishes include white oak chevron flooring, wood paneling, and chic wall coverings. Cinder House opened in August in place of the Four Seasons' previous restaurant, Cielo. The Four Seasons and Gerard Craft worked with CASCO + R|5 to design the space. PARIC Corporation was the general contractor on this tenant improvement project. View the full article in the St. Louis Business Journal.